Moroder, a longterm silent film fan, had two objectives when he set to work on Metropolis. He wanted to restore it, that is to make the most complete print possible from archive material gathered from all over the world, and he wanted it to appeal to the MTV-generation moviegoers of the day. While both aims are entirely laudable, in the end, what he did was more akin to producing an album than the invisible mending required in restoring a film. His touch is here in every frame. It’s Moroder’s film, every bit as much as it is Lang’s. If you loved this film 1984, if it turned you on to silent cinema or Moroder’s music, you may well enjoy it still. If you went on to continue watching silent films, you’ll probably find much here that is crude, and acts as a barrier between the audience and the film. This is the version of Metropolis that I first saw, as a student, and I found it confusing and lurid. Halfway through the movie, I am ashamed to say, I turned the volume down. 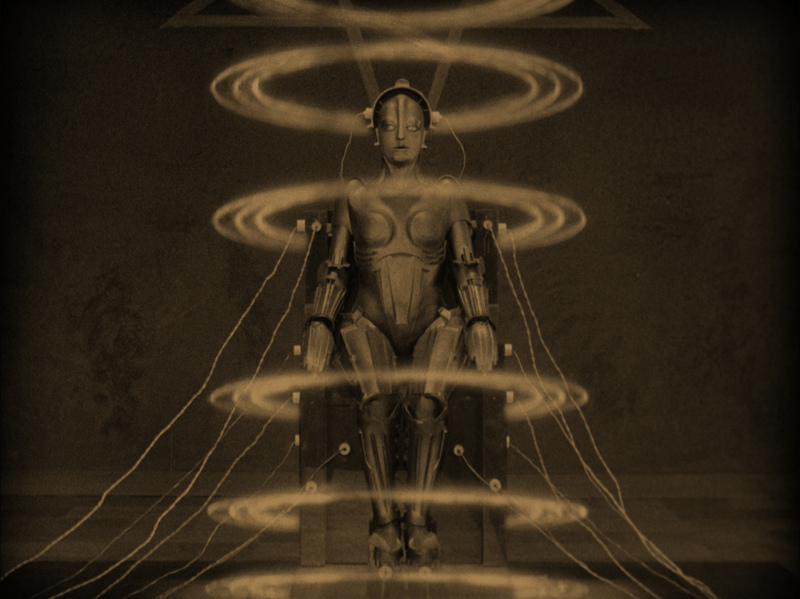 For years I was baffled as to why anyone would call Metropolis a masterpiece of cinema, rather than of set design. Now I know the film better, I’m giving Moroder a second chance. 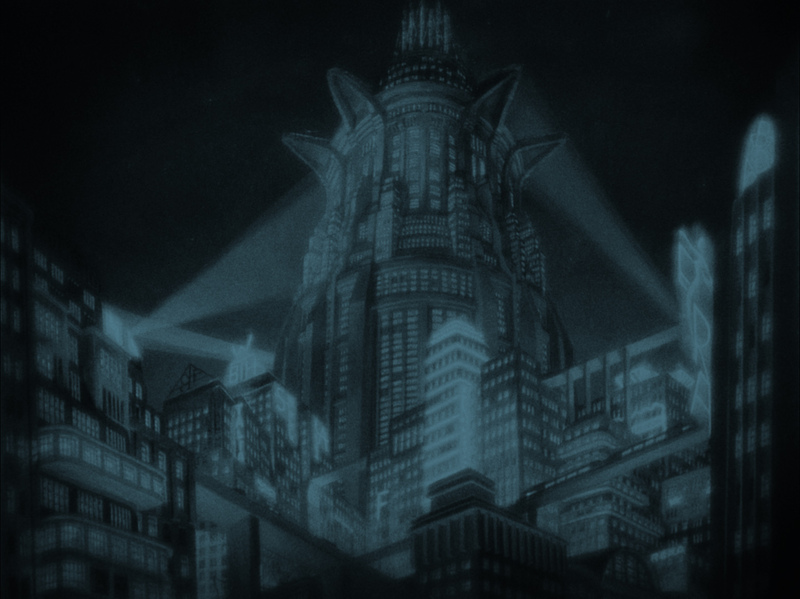 This Metropolis is just 84 minutes long, and that’s not just because it is still missing so much footage, but because the intertitles have been removed and replaced with subtitles. This still jars with me, I’m afraid. The pauses enforced by the intertitles are part of the rhythm of a silent film. This breathless approach may seem more in tune with modern cinema, but if anything it serves to make the performances even more histrionic. Why are they rolling their eyes and staggering about when the words come so easily? Those subtitles also, of course, distract the eye from the film’s astounding visuals. Yes, I’ve seen Metropolis look crisper, with subtler tones, but even in the scruffiest print the joy of the film is in gazing awestruck at that terrifying city, the towering wall around the stadium, the skeletons in the cathedral, that iconic man-machine and its transformation into a woman. There’s no time to do so, here, and those subtitles actually work against the film’s greatest strength. Moroder went to town on the visuals too: he washed Metropolis in a series of tints and tones, fair enough, but he also used rotoscoping to approximate a version of early-cinema stencil tinting. This is perfect for those who lack imagination. Who knew Freder’s face, was, erm, flesh-toned? It isn’t a cardinal sin though, it’s just a bit kitsch. Likewise, the animation of stills to fill in a few gaps in the storyline is inventive and far pacier than a po-faced caption card. Freder’s journey to the “house of sin” takes on a fun comic-book-noir feel; I almost expected a speech bubble. It’s the soundtrack that made this movie notorious, and here any notion of historical sympathy for the cinematic practices of 1927 flies out the window. And why not? I relish the fact that silent films can be screened with different scores, and feel that there is no kind of music that should be ruled out. If the accompaniment is sensitive to the film, then it doesn’t matter whether it is played on a piano or a synthesiser. And Moroder’s glossy electronica is clearly an excellent fit for Metropolis’s seductive futurism. The instrumental portions of the score are gloriously ahead of of Lang’s time, and adapt neatly to the film’s sci-fi sheen as well as to its gothic recesses and furious action sequences. I’m fond of the theatrical use of an organ, or a synthesised organ tone, during the Tower of Babel insert. What I am more wary of is the use of songs in a silent film soundtrack, and more so, the presence of sound effects. We can all see the water bursting through the dam, the steam escaping from the factory chimney – we don’t need to hear them. 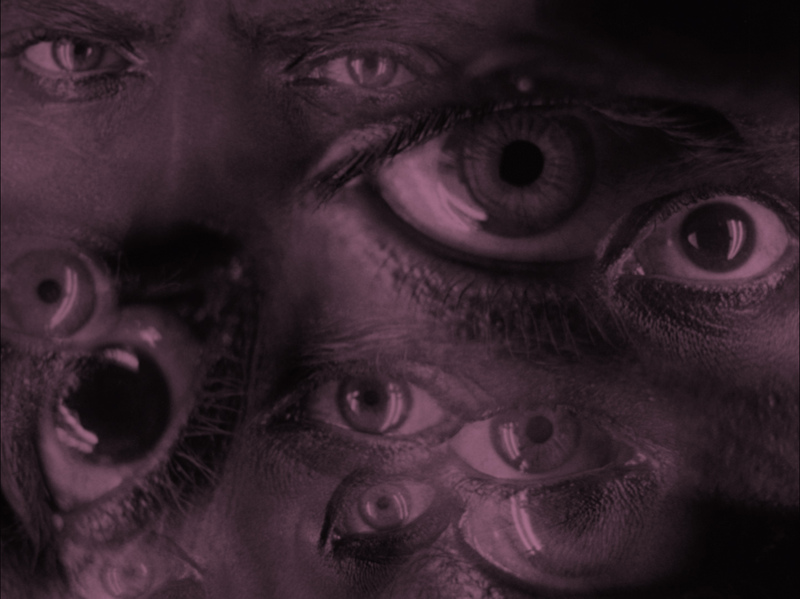 That’s part of the beauty of silent cinema, experiencing how our visual sense engages all the others. Dropping in the occasional siren or whistle just breaks the spell, and condescends to the audience. There’s no need for it, and feels like an apology for silent cinema rather than a celebration of it. The songs are a different matter. They certainly haven’t dated as well as the rest of the score, and it’s unfortunate that the names on the soundtrack (Bonnie Tyler, Pat Benatar) now suggest cheesy nostalgia, rather than rock’n’roll thrills. That’s not the problem though; no one said silent films had to be cool. The awkwardness is that the verse-chorus-verse pattern of a pop song leaves no room for the music to respond to on-screen action, and the lyrics, particularly these lyrics, simplify the narrative, rather than allowing the nuances of a scene to play out. On occasion there is unintended comedy as the lyrics underplay the plot, as when the workers storm the factory and Loverboy sings: “Forget the boring details/We’re only splitting hairs … Well, nothing’s going to stop us now/So who cares?” Thanks for your input, mate. Thanks mostly to those unforgettable numbers, this is the campest Metropolis you’ll ever see: not so much one for the cinematheques as for the SingalongaLang midnight show. 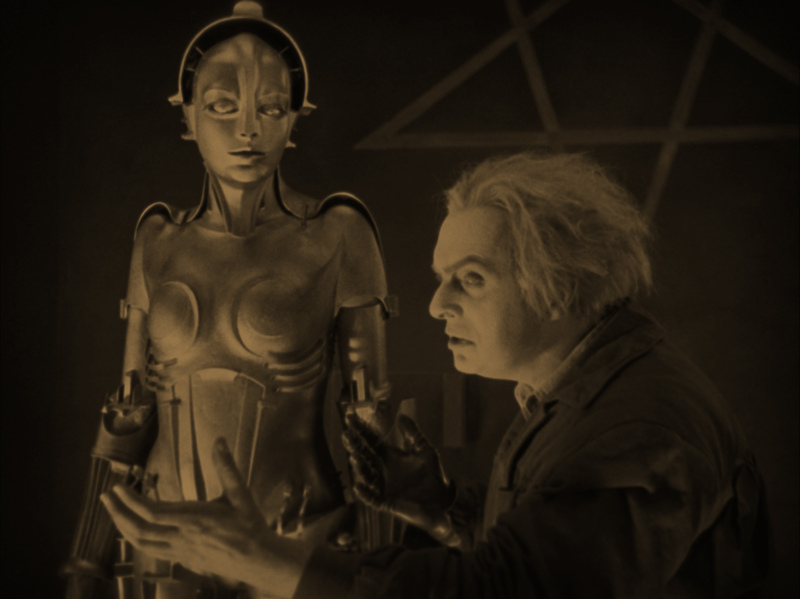 While this is not the version of Metropolis that I will love the most, there’s no need to sneer at it – it can’t take away the pleasure we find in the original, and it has a charm all its own. Please don’t make this the Metropolis that you remember, but do applaud the spirit in which it was made. And thank the lord for the Museo del Cine in Buenos Aires. This DVD is in fact a restoration of a restoration (a digital transfer of rare 35mm prints) and the original stereo mix is accompanied by a 5.1 audio option. By far the best thing on this disc is a genuinely fascinating contemporary documentary called The Fading Image, which details Moroder’s work on the film, but also gives a brief history of Metropolis and offers a snapshot of the silent film scene in the early 1980s. 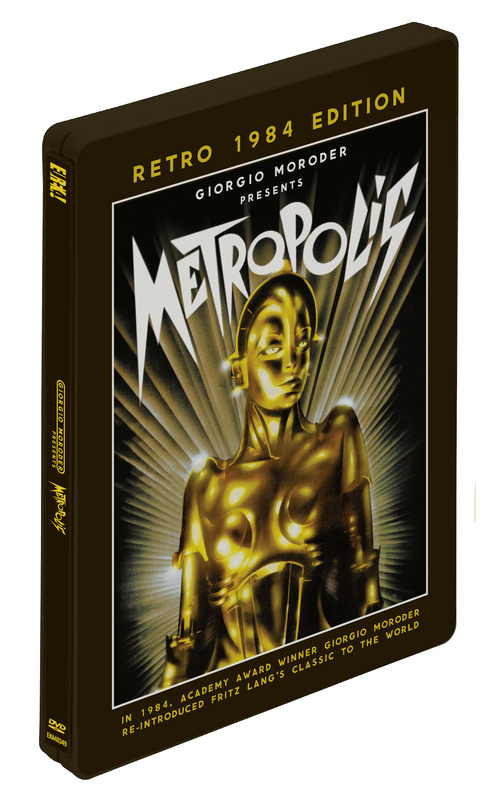 Giorgio Moroder Presents: METROPOLIS will be released by Eureka Entertainment on 23 July 2012. It will be available on a Limited Edition DVD SteelBook, and for the first time throughout the UK, made available for streaming, through a new revolutionary VOD technology provided by Yekra, at www.metropolismovie.co.uk. Great review, thank you. 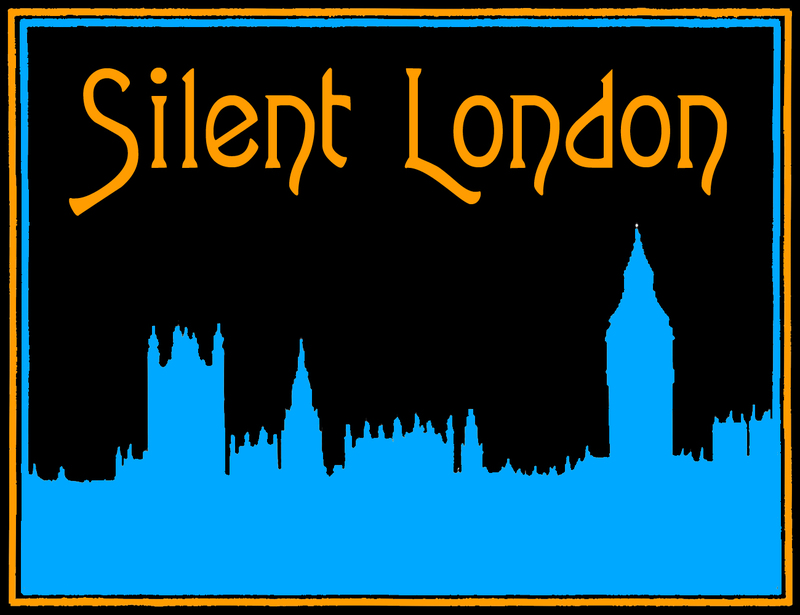 You said “We’re still waiting for many silent classics to appear on DVD” do you have any ones in mind particularly? I have relied on the 1001 movies book for most of what I have seen as far as silent cinema goes (with a few exceptions). An excellent question. The list is very long, but I asked a few of the site’s followers for their picks and we came up with (in no particular order) Greed, The Crowd, The Bg Parade, What Price Glory?, The Wind, Napoleon, Four Horsemen of the Apocalypse, Beggars of Life, Man Woman and Sin, The Student Prince in Old Heidelberg, Woman of Affairs and a heap of British films, including Underground. The good news is that you can see many of these films theatrically or at festivals from time to time. There are also many titles available on scrappy DVDs that could be improved.